This post contains affiliate links – If you decide to buy any of these books via my site, you won’t pay any more but I may receive a teeny amount of commission. 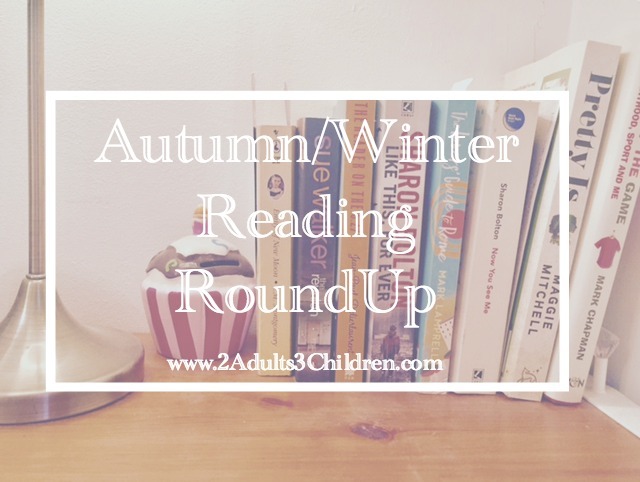 Before I start my reading round-up of year, I thought I’d better check in with my Autumn/Winter Reading Roundup. I’m in the middle of reading one book at the moment which I’m desperately hoping to have completed by the turn of the year. Love the feeling of a complete new start and a blank page of reading goals. Sofia takes her mother, Rose to a clinic in Southern Spain as a last resort to find answers to her unexplained illnesses. Her whole life has been dogged by her mother becoming frailer and more ailments appear all the time. I really didn’t take to any part of this book at all – I didn’t like either Rose or Sofia and found my mind wandering frequently. The only part of the book that seemed to flow was when Sofia visited her father and his new wife. The book explores a family’s love, sexuality (which I half think was written in a way to try and shock the reader – it didn’t). It just didn’t seem to get anywhere and I was very glad when it ended. Caitlin and Patrick are recently separated and Eva is learning to live her life in a different way to that she expected. They have 2 children, Joel and Nancy. The story also centres around Eva, Caitlin’s sister-in-law who is getting over the death of her husband. I knew beforehand that this was likely to be a light read, it wasn’t as speedy as expected though. I wanted to feel more for Caitlin but I couldn’t really feel strongly on her side. Patrick didn’t seem consistently the bad guy that he was made out to be and Caitlin seemed unrealistically infatuated with a new relationship. I did enjoy the parts of the book about Eva – The writing seemed much more realistic about how she found out her husband was not quite the person she first thought. All in all, an ok read. I’d say there will be some people who really enjoy the escapism – I just wanted a little more. I received a copy of this book via Net Galley in exchange for a fair and honest review. Anyone who has ever watched one of their children with a younger sibling in tow will empathise with Mark in Chapter 6. We once had a man thinking he understood how hard it was to have a toddler watching at a sporting event by comparing her to owning a dog. Er no?! There were some parts of this book that really gave food for thought. I loved the section where Mark Chapman talks about children being taught much more than their sport at training. Something we have been banging on about for years is that they learn about ‘respect, friendship, teamwork as well as sport’. Highly recommended for anyone with children whether they are showing sporting prowess or not! Kim & her husband, Brian are setting out on a tour round the world. They’ve left their jobs, sold their house and all their belonging ready for the big adventure. Just before they leave, their friends hand them a yellow envelope containing money – They can do exactly what they want with the money, spend it on whatever they like, don’t spend it, spend it all at once or in dribs and drabs. The only rules are the money has to be given to make something better. They are not to overthink how they are spending it and they must be prepared to share with people how it was spent. This is a unique twist on a normal travel book – From the start, the reader is intrigued how the money is spent. This is a book that is easy to speed through. The couple have some brilliant experiences and equally some pretty horrific encounters – I’ll never get on a coach and take toilet facilities for granted again! We learn about their relationship and the friends they meet along the way. I’m only half way through so cannot give a full review yet but am thoroughly enjoying and its looking like a 4 Star read so far. I’ll update soon! EDIT: I have now finished The Yellow Envelope. I think the first part of this book was definitely stronger than the end but it was still a thoroughly enjoyable read. Kim’s experience of travelling through India on a rick cart will stay with me. I was glad that there was a chance to revisit the couple 12 months after their adventure – I won’t spoil it for you but it was a nice moment. I received a review copy of this book via Net Galley in exchange for a fair and honest review. I’ll be back in a couple of days with my Top 10 Books of 2016 – Come back to see if you agree with my choices! It was a lovely thing for their friends to do – the reasons behind why they did it are rather touching too but I won’t spoil that part of the book for you. All the books here are new to me and shame about Hot milk, I want to read it and see why other people where loving it. What a great way to look at it – I love that you are hopeful in seeing what other people enjoyed. Thanks for commenting. I’ve just finished Harry Potter and the Philosopher’s Stone yesterday – Loved it. Can’t believe I’ve waited so long to read HP. I’m so glad you got my meaning – Yes, it need a little ‘more’! I always like some good book recommendations. I will stay clear of Hot Milk though 😉 Nice to see someone else enjoying a good read. Hope you enjoy some of these recommendations – Other people have loved Hot Milk but sadly not for me! I enjoyed the extra element as well as the travel – The parts where they travelled around India were fascinating and a little scary! I’ve seen loads of bloggers raving about Hot Milk… makes me a bit suspicious actually! I hate it when you just can’t connect with characters. Let me know how you get on, Stephanie – Hope you enjoy some of the recommendations. Really interesting to hear your varying views on the books – from the good to the not-so-good. The Yellow Envelope sounds like a great read! Thanks Milly – The Yellow Envelope is a different type of looking at a travel guide. I enjoyed the human element. These sounds like great reads. I’m off to add them to my wishlist. Hope you enjoy them Jemma – Let me know which ones you get through! The yellow envelope sounds good, I’m currently reading Lisa Genovas Still Alice. Hope you enjoy the recommendations Harriet – There is a quite a variety here! I am adding some of these to my wishlist, as I really need to start reading more. The yellow envelope is standing out to me, it sounds really interesting! I used to devour books but so rarely get chance to read any more.